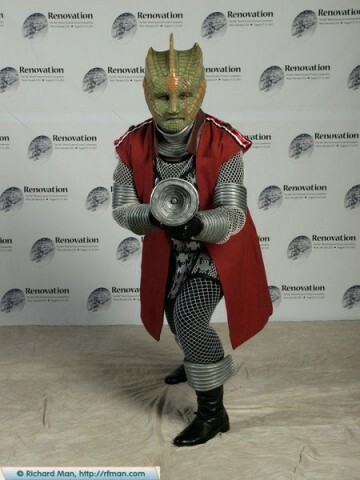 Doctor Who Silurian Costume « Adafruit Industries – Makers, hackers, artists, designers and engineers! According to costume creators Bryan and Mette, the head was sculpted from a clay mold taken of the costume wearer’s head. After giving it some texture, both silicone and fiberglass were brushed on, followed by the final colors. The rest of the costume was constructed from a modified shirt pattern, using both fabric and fishing net. The armor, including the arm bands and gauntlets, as well as the gun, was hand sculpted out of foam. A dremel tool was used for the engravings.